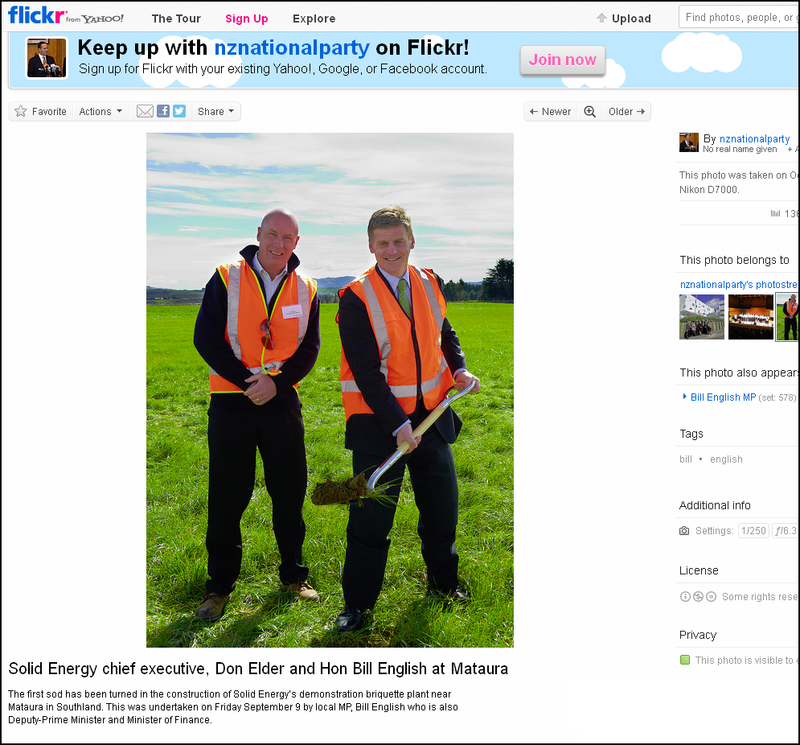 A year and a half later, neither Dear Leader Key nor Little Leader Bill English seemed terribly keen to be associated with any more photo-ops with Don Elder. It’s amazing how politicians seem to have this ability – verging on a preternatural super power – to distance themselves from something they had only recently embraced and supported with whole-hearted gusto. Plus millions more paid in company tax. It seems remarkable that National only discovered a couple of days ago that Solid Energy’s financial position was not sound. What was Bill English doing last year? 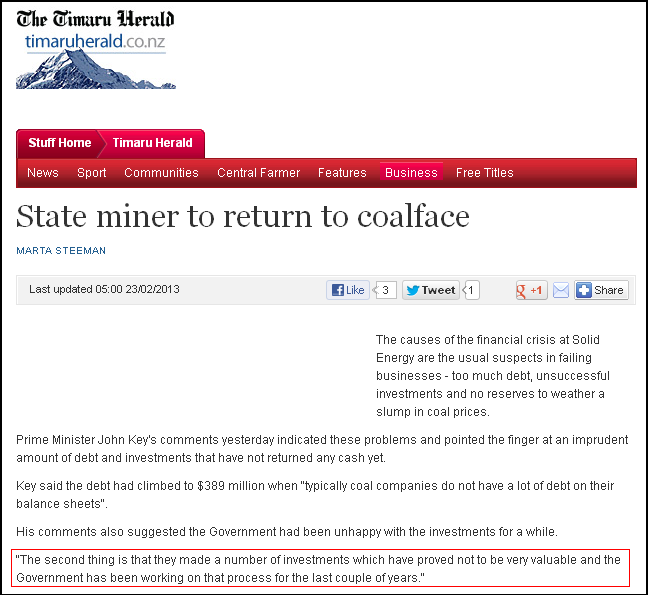 How could Solid Energy’s financial position go from a pre-tax profit of $127.5 million (see: Solid Energy shines despite earthquakes) in August 2011 – to a massive $389 million debt this year? Did National gouge one of our cash-state-cows? 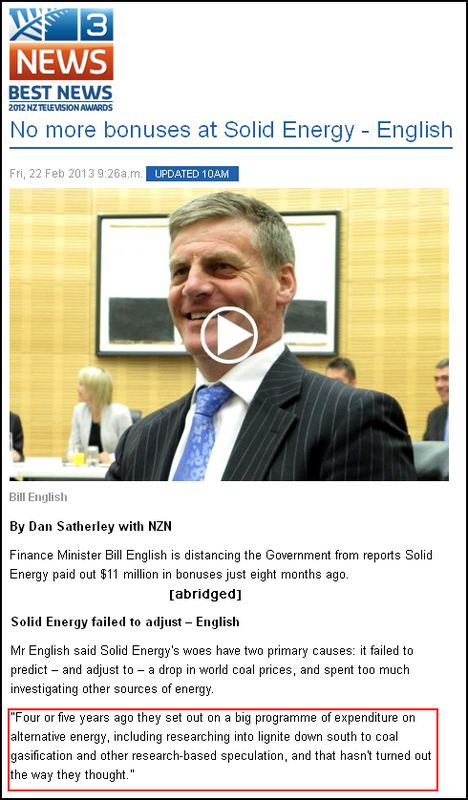 With Solid Energy’s expansion projects (which Bill English must’ve known about, as he turned a sod of earth in Southland on 9 September 2011), were the dividends paid since 2009 realistic? With National’s track record of constantly shifting responsibility away from themselves, who are pointing the finger at? With all the highly paid Ministers, board members, and executives – will the office cleaner be held to account? Is the corporate model, with big salaries and bonuses paid to executives and an evident lack of transparency, appropriate for state owned enterprises? Will workers be made to suffer job lossses and subsequent economic hardship, because of the actions of Solid Energy’s executives and Crown Ministers? Why aren’t the workers offered the same ‘golden parachute’ that ex-CEO Don Elder most likely received? No doubt neo-liberals will point to the failure of ‘Solid Energy’ as proof-positive that governments cannot run state-owned businesses. This is proof positive that National (or other right wing) governments cannot run state-owned businesses. LOL some very poor management by Elder and Solid Energy. Yeah, $1.1 million worth of bad management.